Who doesn’t love a good fruit dessert this time or anytime of year? I know we all do in this house and my family! Since my family is visiting from Southern California, I thought I’d hook them up with an epic delicious dessert. Cobblers are just that, so so good. 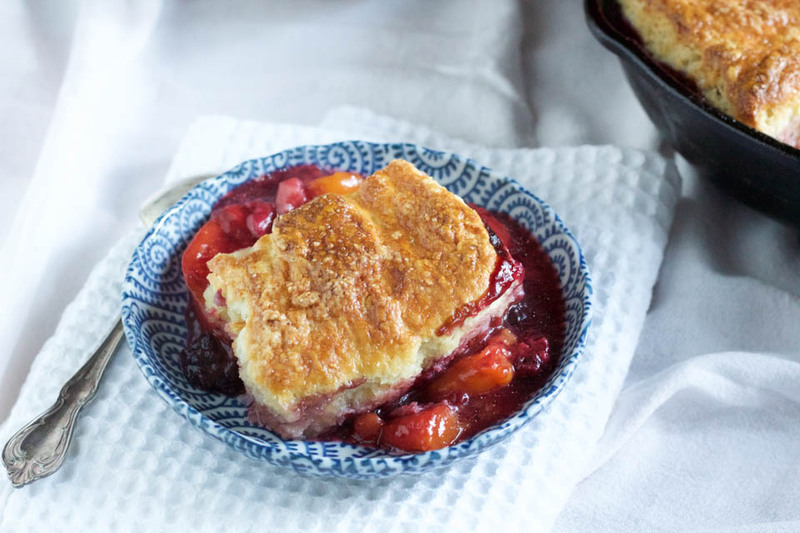 Easy to make, mouthwatering Summer fruit, baked to a sweet perfection with a buttery crust on top. It’s a love situation, and I am certain when I am finished baking it my niece will be eating as much as she can! She loves sweets as much as I do, which is a lot. Dessert is her favorite, next to vegetables, just like me lol! She’ll eat tons of vegetables for dinner and then ask for dessert. Tonight she will be pleasantly surprised by this treat! I’m keeping this short and sweet, no pun intended! As my family is here and I have a seven year old niece that wants to play, we are going to hang around town, play at the park, go swimming, blow bubbles, and hoola hoop until we can’t move anymore. It will be epic playing with her auntie and uncles this week, possible tons of ice cream and cobbler involved! Fruit note: Always taste the fruit you are using in recipes to gauge how sweet they are. If they are tart, you’ll use more sugar. If they are super sweet, you’ll use less sugar. I used a 10 inch cast iron skillet. You can also use a 2 quart glass pyrex baking dish, ceramic baking dish, or pie pan. Place oven rack in center of oven and preheat to 375 degrees. 1. Place sugar, flour, and salt in a medium bowl, toss to combine. Add peaches, blackberries, and lemon juice, toss to combine, pour into pan. 2. 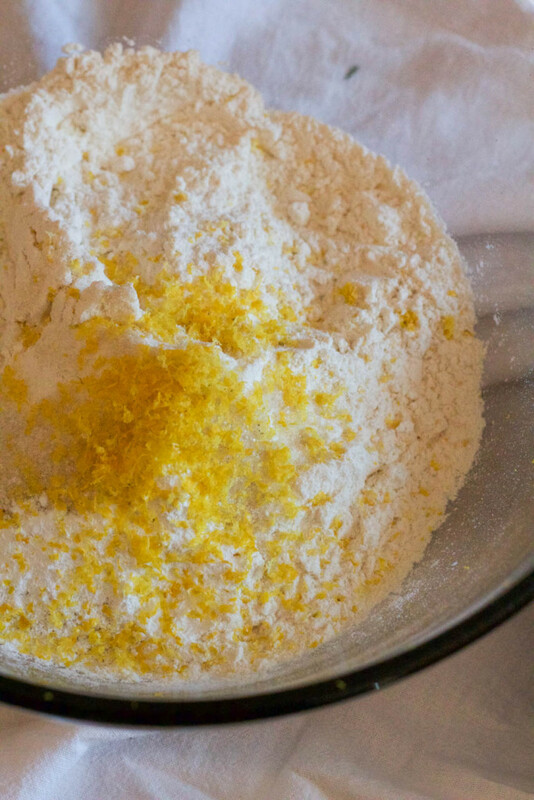 Cobbler topping- Place flour, sugar, salt, and lemon zest in a large bowl, toss to combine. Add cold butter cubes, using your fingers or pastry cutter, rub butter into flour gently until pea sized chunks are formed. Add cold buttermilk, using a spatula, mix gently until combined. 3. Turn dough onto a lightly floured counter, form a ball. Using a rolling pin, roll out into a square or rectangle about 1/2 inch thick. Using a knife, bench scraper, or pizza cutter, cut into 2-3 inch squares, about 12 pieces total. 4. Place dough squares over fruit. Brush with egg wash, sprinkle with sugar, place on a baking sheet lined with parchment paper, place in oven, and bake for 50 minutes, or until top is golden brown. Other super awesome fruit desserts on Not Just Baked! Other super tasty fruit desserts from my blogging friends! This so screams summer for me! So yummy looking! 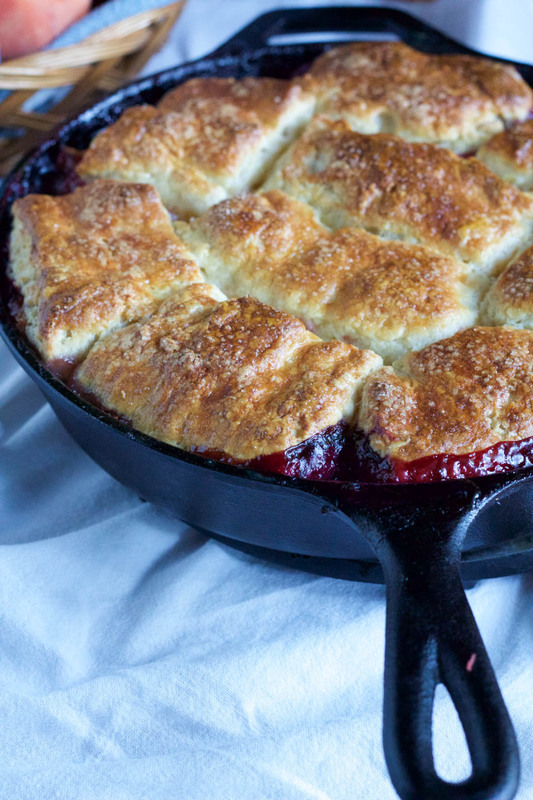 I’m a sucker for skillet dishes so can’t resist this one. Those dough squares on top make it look so fun! Looks fantastic! great for all those summer berries! Desserts with fruits are my favorite! 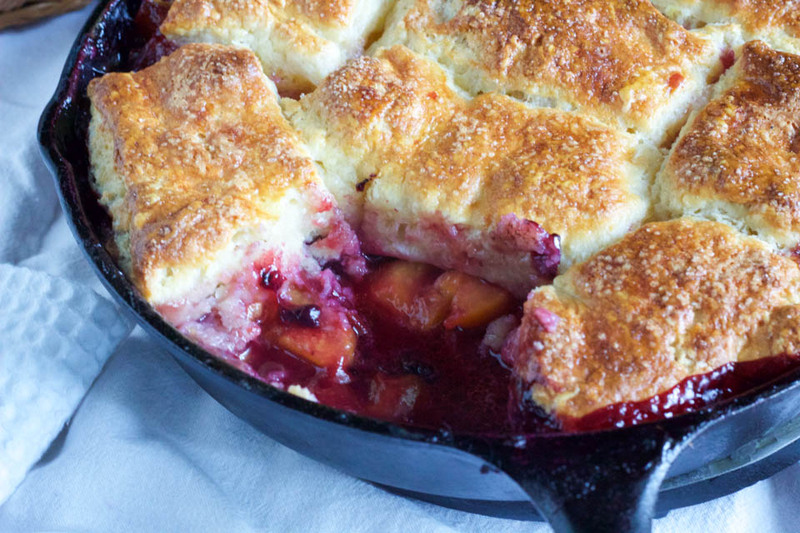 Peach and blackberry sound like a delish combo! Cobblers are one of my favorite parts of summer. 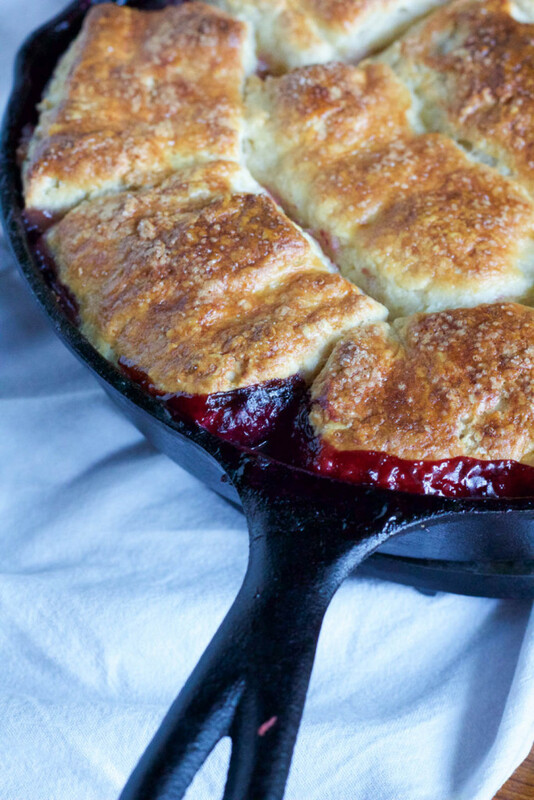 Warm, summer fruit and a golden doughy topping – the best! Your topping looks incredible! I love a good fruit dessert and this looks fantastic!